“The scan-converter used three phase power. It was the only piece of equipment in the room that did. All the other equipment was running on a 110 volt panel that was well labelled. Black is hot and green is ground in the USA, but in Australia black is neutral. It had originally been hooked up correctly to the US standard as we had just completed a full blown simulation the day before. The unit was fused for 240 volts as it had a three phase power supply, but it was the out of phase power that caused the massive current that did all the damage. Apparently an OTC technician working on other circuits thought the black wire was wrongly connected and changed it. When the scan-converter was switched on the next day it blew up. I got a meter out and checked the incoming power and found the mistake. “I repaired or replaced the slow scan monitor, NTSC monitor, camera, disc recorder, power supplies, and Grass Valley video equipment. The camera in the scan-converter was totally fried. The new camera did not have the inversion modification in it. I couldn’t take the hardware out of the bad one to modify the new one, so I had to buy all the components in Sydney. I couldn’t get the exact relays, so I had to specially design the one for Sydney. It was different to the others. Ted Knotts and Elmer Fredd came over from the USA to help with the repairs. 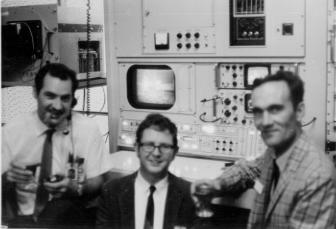 Ted did all the logistics like getting Hewlett Packard in Sydney to fix the waveform monitor and Tektronix to fix the oscilloscope, and getting us the spare parts and tools we needed. Elmer and I would never have gotten it all done without Ted taking care of our needs. I had to perform a lot of magic, but nothing compared to the magic Elmer performed when he started working on the converter logic. I bet we replaced over a hundred transistors (all discrete components) and we were still replacing them while the boys were on their way to the Moon. We made it and so did they”. I believe that it was around this time (minus 40 years) that the scan converter repairs were completed. Not mentioned in the text above (courtesy of my good associate John Sarkissian and CSIRO) was the fact that a motor/generator set was needed and was arranged and secured to a plank of wood in the basement of the Paddington terminal. It worked! This entry was posted in Apollo and tagged Apollo, ITMC, NASA, Paddington by Robert Brand. Bookmark the permalink.